Caught with 6 Viruses, 4 Of them Trojans! 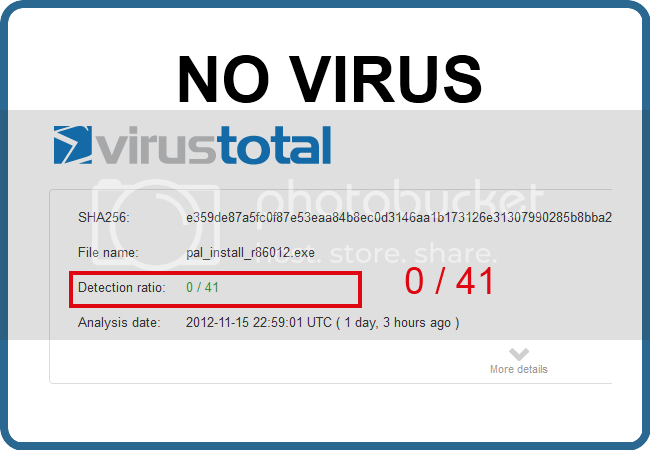 Caught with 2 Viruses, 1 of them TROJAN_GEN! Ok do you know what makes developers like mad on the other hand also sad? THE IMAGE ABOVE IS PALTALK BUILD 474 - ORIGINAL! This was downloaded from http://www.PALTALK.COM 10 mins ago! And as you can see it was tested first time 1 Days + 3 Hours ago..
Look at the image on top, and the ICONS.. These are the 2 the ICONS attached to each Installer, so look out for these 2 Installers! I HAVE ALSO NOTICED that ONE of the INSTALLERS are using Paltalk.DarkBBs ICONS, and I dont think PALTALK DARKBB has anything to do with these CRACKS! We do not wanna see any MULTI with even affected with 1% on Dutchplace, or on our forum china-Cheats... The user will be banned, and software removed. I think everyone forgot about how dangerouse People are playing now today.. EVEN WORSE THAN BEFOR. The reason I started to test these version was because lately I have friends who's nicknames have been stolen, and credit cards stolen! WHY??? Because they use these cracks! And the version on China-Cheats have been posted for weeks now! But I had a chance to test them first now, because I did not suspect it!